Handbook of Research Methods in Industrial and Organizational Psychology is a comprehensive and contemporary treatment of research philosophies, approaches, tools, and techniques indigenous to industrial and organizational psychology. 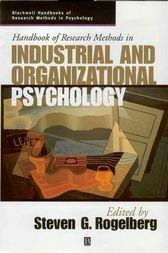 Only available research handbook for Industrial & Organizational Psychology. Contributors are leading methodological & measurement scholars. Excellent balance of practical and theoretical insights which will be of interest to both novice and experienced organizational researchers. Great companion to the content-oriented Handbooks. Dr. Steven G. Rogelberg (Associate Professor, Psychology and Adjunct Associate Professor, Business Administration) is Director of the Industrial and Organizational Psychology Program at UNC Charlotte. He has over 45 publications and 25 invited addresses/colloquiums addressing issues such as organizational research methods, team effectiveness, health and employee well-being, meetings at work, and organizational development. He is the Editor-in-Chief of the two-volume Encyclopedia of Industrial and Organizational Psychology (in progress). Recent honors include being named Chair of Education and Training for the Society of Industrial and Organizational Psychology (SIOP), serving as a SIOP Executive Board Member, serving as Guest Editor for Organizational Research Methods, receiving the 2001 Bowling Green State University (BGSU) Psi Chi Professor of the Year Award, and receiving the BGSU Master Teacher Award. Prior to his recent tenure at UNCC, Rogelberg was an Associate Professor of Psychology in the Industrial and Organizational Psychology area at BGSU. Before completing his Ph.D. in Industrial/Organizational Psychology at the University of Connecticut in 1994, he received his undergraduate B.Sc. degree from Tufts University in 1989.